1. What brought you into this industry? I’ve been fascinated with the potential of this plant since I first experimented as a teen. Despite the taboo rhetoric, or lack-thereof, I’ve always been adamant on the beneficial aspects from consuming marijuana. It wasn’t until I acquired migraines in college that I truly grasped the importance of this plant. Simply put, I could not imagine achieving my higher education without it. Pun unintended. However, the real push comes from my experience in Gainesville, Florida where I had the pleasure of being introduced to disabled Vietnam War veteran, Martin VanGelder. This bronze star, purple heart, and combat infantry badge-having human became my first and only true friend in the sunshine state. One sad day, he broke his terminal illness news (agent orange and impact wound induced) to me. Desperate for relief and with a healthcare background, he carefully asked me to assist in an “empirical study” conducted by himself. I picked up the finest, high end, strain I could find; Pineapple. This man went from taking morphine 4X a day to 0, was able to attain a regular REM cycle at night, and finally regained an appetite!! It is with my honor to give full credibility to Marty’s testimony in his final days for my reasoning in pursuing this career. His positive outlook/wisdom over early morning coffee and laughs will live on forever in my work. 2. What excites you most about coming to work every day? This is a loaded question for me, for there are many reasons that hold equal weight. There’s almost a thrill involved when helping a naïve patient pick the pieces to the puzzle along the journey of their relief roads. I’m anxious to see their progress and proud to be of assistance. 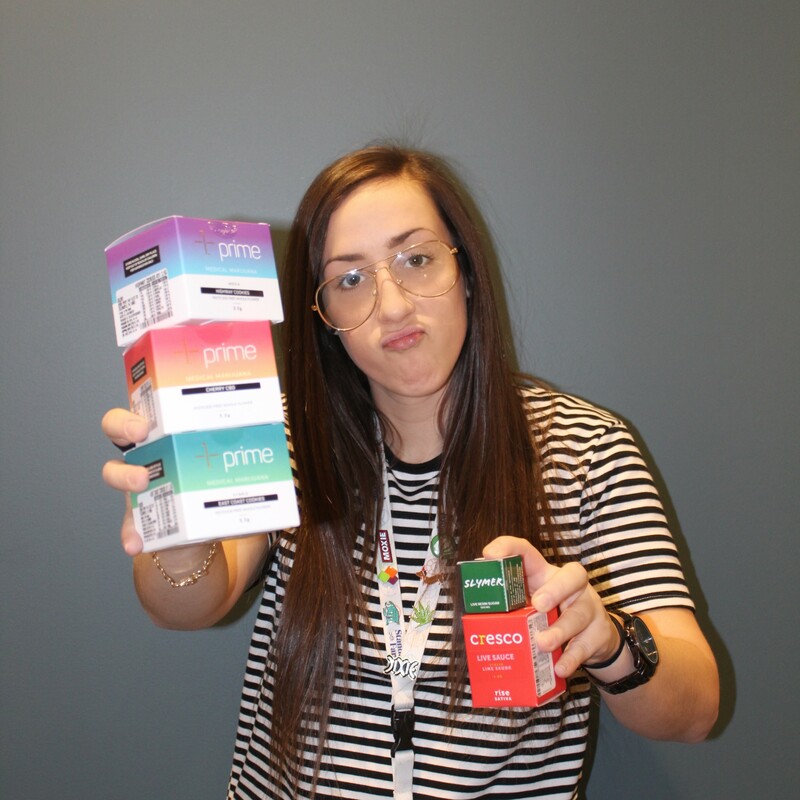 Secondly, my work environment is unmatched. Never in my life have I felt like work is “home”. My coworkers keep me on my toes with education, inspire me to be great, and the reassurance is overwhelming at times. I genuinely love my job and my crew. 3. What has been the most rewarding part of being a PCC at Solevo Wellness? Easy. Seeing our patients return with smiles on their faces, because they’re finally experiencing relief, is the most rewarding thing I’ve ever experienced. The Libra in me goes wild and holds back tears of joy almost daily. 4. If you are a certified MMJ Patient, what is your favorite strain & what does it help with? My favorite morning medication thus far has been derived from the strain Tangie in the form of concentrate. It immediately elevates my mood to a super-hero status, with impeccable energy, clear headedness, and mental clarity. I can clear a whole week’s schedule in a morning’s dose (or two). I cannot be in a bad mood with Tangie or Sour Tangie. If you ask any of the PCC’s at Squirrel Hill, they’ll tell you I can’t speak highly enough of Banana Split from GTI (also concentrates form). Before I am even able to exhale, I feel this medication melt my body tension from head to toe. An immediate warming sensation in my chest spreads throughout my limbs, leaving my actual face feeling weightless. 5. What do you consider your MMJ Expertise? I’m far from an expert with SO MUCH to learn… but, I’d have to toot my cannabinoid/terpene horn a little. 6. What are you hoping to expand your knowledge on? I’d like to fine-tune my knowledge on specific diagnoses. With zero background in healthcare, it can be a little overwhelming at times. Keeping in mind that we aren’t treating the patient, rather the symptoms (shout-out to Zach K), really helps ease my anxiety about strain/form/dosage recommendations. 7. What is one thing you would want someone thinking about trying MMJ to know? I’d want to inform them of the endocannabinoid system. I’ve realized that once people acknowledge the fact that we have an entire system built in our bodies meant to receive the compounds extracted from this plant, their perceptions seem to alter. A lot of times, people just want proof. And darlin’, the proof is in the pudding! 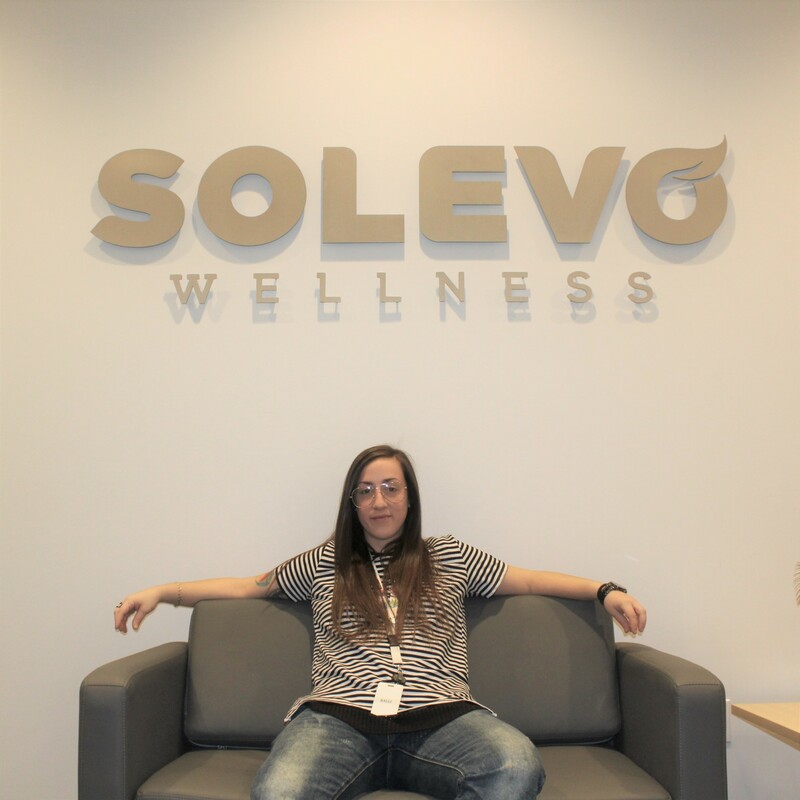 Want to know more about Kalli Osborne, Solevo Wellness PCC? Stop in and see her soon!